Calling the shots? 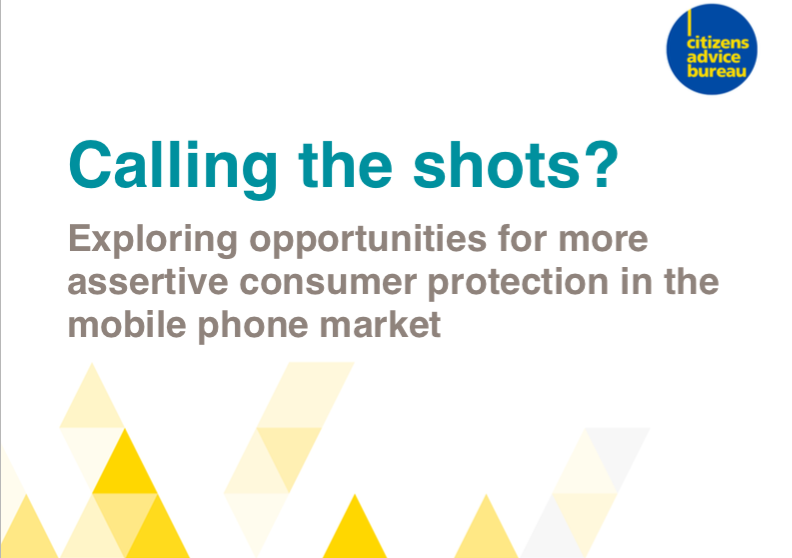 is the title of a new Citizens Advice Bureau report that analyses consumer problems in the mobile phone market and explores opportunities for stronger consumer protections. 39 per cent of our cases relate to f​aulty mobile phones​ and in particular to confusion over who is responsible when a mobile breaks. We see widespread uncertainty over how responsibilities divide between independent mobile retailers and mobile networks. 17 per cent of the cases relate to s​tandards of service and contract exit terms. Typically these clients receive no or poor signal despite checking coverage maps and then struggle to escape their contract without large exit fees. These cases 5 often come down to ill-defined or unreasonable minimum standards of service. 12 per cent of the issues related to b​illing disputes.​ These callers have often been hit without warning by a sky high bill, some as high as £3,000. This includes cases of mobile phone theft in which our clients have been hit by bills up to £23,000 to cover costs incurred by a mobile phone thief.